PLEASE CONTACT A MEMBER OF THE DEPARTMENT FOR PICTURES, FULL DESCRIPTIONS AND AN ACCOUNTING OF ALL OF THE PIECES AND THEIR CONDITIONS. The Edulji Dinshaw Louis XV Boiserie has been accorded its name, because, during the middle years of the twentieth century, it served as a paneled room in the townhouse that stood at 1081 Fifth Avenue, between 89th and 90th Streets, and that belonged, then, to Edulji F. Dinshaw (1916-1970). Edulji Dinshaw, a Parsi from Mumbai, settled in New York with his sister, Bachoo, shortly before World War Two. New York was their home for the rest of their lives. The photograph illustrated here shows them in front of the central bay of the window wall of the room, then at 1081 Fifth Avenue, that was paneled with the Edulji Dinshaw Louis XV Boiserie. to about 1940 and shortly after. This period saw legendary American collectors (Pierpont Morgan, Henry Walters, Henry Clay Frick); Mrs. Hamilton Rice and others who furnished their homes with museum quality works; New York branches of prominent European dealers and Parisian interior decorating firms (Jacques Seligmann & Co. and Duveen & Co.: Allard & Co. and Carlihian & Co.) as well as the pioneering New York decorator herself, Elsie de Wolfe. French and Company, Jansen and L. Alavoine & Company also were options for the interior decorating and antique collecting clientele. The quality and quantity of works of art of all categories that were in New York, then, privately owned and on the art market, were such as has never existed before or since in this country. In this context, the riches contained within Edulji Dinshaw's house at 1081 Fifth Avenue were logical and normal for that time and at that level. According to the photographs, the room paneled with the Edulji Dinshaw Lous XV Boiserie was furnished and appointed with eighteenth-century furniture and decorations in a pleasant, contemporary, light and airy manner. Decorative accents in the room were noticeably and refreshingly white. The magnificent rock crystal chandelier, obtained from Wildenstein & Co., dominated the room and is one of the great examples of its kind extant today. It is almost five feet high and almost four feet in diameter and it supports thirty-two lights on two tiers of branches. The bottommost part of the chandelier is visible along the upper edge of the brother-sister photograph. Two large white porcelain sculptures that appear in the paneled room's photographs constituted part of Edulji Dinshaw's collection of the nearly life-size white Meissen porcelain animals and birds that had been created around 1730, and shortly after, for the Japanese Palace in Dresden of Augustus II, Augustus the Strong, Elector of Saxony and King of Poland. Edulji Dinshaw's collection in this category, housed at 1081 Fifth Avenue, was probably the largest assemblage of its kind in the United States up to the mid-twentieth century. The "vase" containing forsythia, prominent in the foregrounds of the paneled room's photographs, is an ornamental ewer from the Japanese Palace that is known in the Meissen porcelain literature as, alternatively, "Untier-Krug" and "Untier-Kanne." Edulji Dinshaw's white Meissen porcelain group, "Nanny Goat and Suckling Kid," is seen in the photograph resting near the floor at the center of the paneled room's tripartite bowed window. This exceptional group was modeled in 1732 by the most brilliant sculptor of any European porcelain factory in the eighteenth-century: Johann Joachim Kaendler, the immensely talented Modellmeister at Meissen. Elsewhere in the Dinshaw townhouse, staggeringly magnificent white Meissen porcelain birds were displayed dramatically on carved and gilded wood wall brackets that were set against stylish and elegantly shaped modern mirrors which, in turn, were fastened against the painted wall paneling. Edulji Dinshaw's white Meissen porcelain aviary included a "Heron Preening Itself." A version of the "Heron Preening Itself." together with its pendant, a "Heron With a Frog," sold at Christie's Paris on 22 June 2005 for E5,612,000. In yet another room at 1081 Fifth Avenue, a most impressive Meissen reticulated "Schneeballen" vase and stand, applied with birds and snowball blossoms, rested on a white and gold commode of the kind that is usually accepted as by or attributable to Francios Cuvilliés, the Elector of Bavaria's French architect and designer in eighteenth-century Munich. Edulji Dinshaw's secure position in the history of collectors and collecting is recognized universally, because by 1947, it was he who reunited, in his New York townhouse, and for the first time in more than a century, the ultra luxurious mother-of-pearl, polished steel and gilded bronze cylinder desk and matching small table that had been made by Riesener for Marie-Antoinette's boudoir at Fontainebleau in 1786. The cylinder desk is understood to have come from Duveen & Company. Marie-Antoinette's mother-of-pearl cylinder desk, according to one who remembers, was positioned against the east wall of the room paneled with the Dinshaw Louis XV Boiserie. As you entered the room through the door at the center of the east wall, the mother-of-pearl desk would have been on your right. That is to say, to the left of the door, if you were standing in the room looking at the east wall with your back towards the Nanny Goat group. According to one who remembers Marie-Antoinette's desk when it was at 1081 Fifth Avenue, "Edulji put a lot of stuff in there and he could never get it open. The locksmith always had to come over." By 1955, the cylinder desk and the small table had left the Dinshaw townhouse. Today, these two extraordinary and magnificent pieces of furniture have been returned to Fontainebleau. Around 1960, as 1081 Fifth Avenue had to make way for 1080 Fifth Avenue, the apartment building there now, items that had been Edulji Dinshaw's were dispersed. Today, the thirty-two-light rock crystal chandelier graces a private residence in the United States. In 1962, Edulji Dinshaw's "Nanny Goat and Suckling Kid" group was given to The Metropolitan Museum of Art by John D. Rockefeller's granddaughter, Mrs. Jean Mauze. Today this bravura procelain group serves as the centerpiece of The Metropolitan Museum of Art's display of Meissen porcelain in the renowned Wrightsman Galleries. One is intrigued to learn that Edulji Dinshaw, from India, was not fond of heat. Carpets were too hot for him; so there was no carpeting in his house. Electric lightbulbs also were too hot for him; so there were no table lamps, either. He had the air conditioner going in January, according to one who remembers. This makes it easy to comprehend that a fireplace in the Edulji Dinshaw's house was transformed from a utilitarian source of warmth into a glamorous chef d'oeuvre. In rounding out this snapshot of Edulji Dinshaw, it is worth mentioning that he was painted by Tchelichew and he was photographed by George Platt Lynes. On another level, entirely, his Bentley's interior was upholstered with leopard, as might be expected then, of a person with means from India. His Indian silk slippers were embroidered with emeralds. On special occasions, his little dog sported and emerald necklace. He spoke perfect British English, having attended Eton, and spoke French fluently. People who know Edulji Dinshaw aver, unanimously, that not only was he appealingly well-mannered, but, most importantly, he was very kind and very generous. He was the nicest person. In the middle of the twentieth century, the Dinshaw Louis XV Boiserie, which Edulji Dinshaw may have purchased and had installed in his house at 1081 Fifth Avenue or which may have been there already when he acquired the house, was part of this overall picture. The author wishes to express heartfelt gratitude to the individuals who, graciously and generously, provided assistance during the preparation of this article. Ronald Freyberger, author, lecturer and researcher, has contributed to Christie's Review of the Season and Christie's International Magazine and has lectured on numerous occasions on eighteenth-century French decorative arts and the history of collectors and collecting at Christie's New York and Christie's Education. 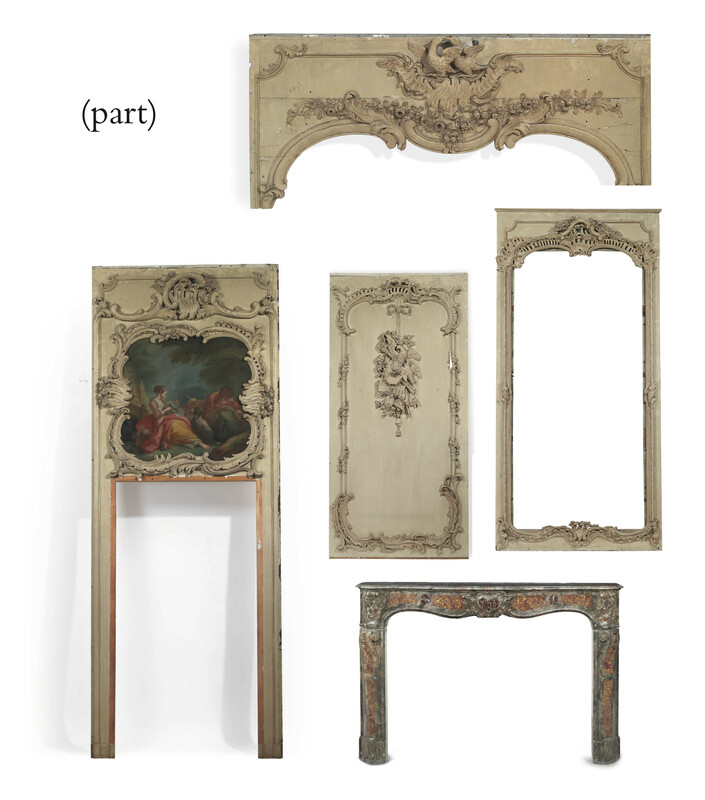 The overdoor panels panels do not appear to be a direct copy of Boucher's work, however although there are significant differences in the compositions and the fact that a sleeping boy is not included among them, they do relate to a series of five decorative panels that were painted by Boucher for the Maréchal de Syncy, Paris (see A. Ananoff, Francois Boucher, Geneva, 1976, vol. II, p. 217, no. 555, fig. 1520).